Sometimes a review is difficult to write. Not today! This review writes itself. I'm not quite sure if a twenty-grand amp can be called a bargain, but I'm going to do it anyway, and I'm going to have to tell you why. Forget for a moment the looks, the size of the box, the technological nuggets inside, just listen to the sound, experience this special imaging. If you were blind testing you'd swear this was a tube amp, so full and alive is the midrange. But what tube amp has such control in the bass? OK, let's not forget the looks. This is one sleek amp, with the highest level of finishing and the smoothest contours. One unusual feature is the use of bright (but dimmable) LEDs on the front display. That may look a little old fashioned, but when the display of my EMM Labs XDS1 player is washed out in my bright new listening room, I can read the Soulution's display easily, so I'm ok with this choice. And the remote control is an absolute winner. It looks like it was designed by the guys at NEST. It's comfortable in the hand, compact, easy to use and reeks of quality. Let's not forget the size. 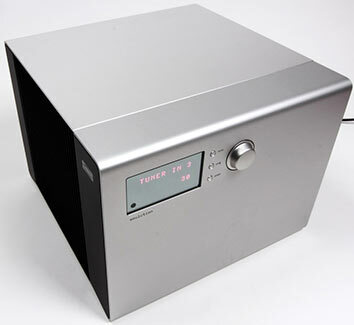 Unlike the 13.8" tall 530 Integrated Stereo Amp that sits next above it in the Soulution range, this one is just 5.6" tall. Depth and width are similar between the two models, and weight is down modestly from 88 to 66 lbs. And as for the technological nuggets inside, well... where do I begin? We should start with the switched mode power supply, trickle down technology from the Series 5 which has also trickled back up into the range topping and uber-expensive Series 7. Unlike the traditional transformer based linear power supplies used in most amps, these are regulated to deliver a stable voltage under any load. They also are lighter and take up less space allowing the 330 to weigh in below many of its competitors. Next is the volume control. A discrete ladder is used so that at any time there are just a few resistors in the signal path, with 90 steps of roughly 1dB each and covering a range of -54 to +36dB. The calibration of these steps is not as precise as in the Series 5, but the sound quality of the volume control is just the same. At most listening levels there are from two to eight resistors in the signal path, with more in line at the lowest volume levels. Unfortunately, the use of this ladder means you are going to hear a series of clicks as you adjust the volume as the switching servos operate. But you don't hear the whole series � just one click as you start adjusting the volume; and another when you stop. Magic? No, just Swiss ingenuity. Soulution has employed a second volume control, lower in quality but silent in operation, to take over the reins while you are making your adjustments, and tightly adjusted to match the dB steps of the ladder. Can you hear the difference? Tough � you don't get much chance to listen to the backup system � maybe a second after you've stopped adjusting the volume. But Cyrill Hammer, head honcho and designer, assures me that not only do the two systems measure differently, they sound quite different. The third unique aspect of the Soulution sound, which is common to all Soulution products, is the ultra-wide bandwidth and high speed of the feedback circuitry � two or three orders of magnitude faster than other amps. This is not an add on to the circuitry but the very basis on which it is designed, using fast switching transistors, ultra-short signal paths and the design of the switched power supply. This high speed is not an end in itself, although it naturally provides many benefits in terms of transient performance and so on. The reason is so that very high levels of local negative feedback can be applied in each stage of the amplifier without the usual adverse side effects of that feedback. Cyrill Hammer attributes those side effects to the slow nature of traditional feedback circuits. If it is to be truly effective, the correction should come instantaneously since the signal can change very rapidly. This is a very different path than that taken by the competition. I will not argue the theoretical merits of this approach, but I will tell you that I am very impressed with the results, and so have been all who have helped me audition this amp. The fourth aspect of design applies to the signal path. Soulution found that the choice of connectors and cable make a big impact on the sound, and their solution is to remove all connectors and cables from that path. Instead, the boards are connected directly to the inputs and outputs. In the Series 5, copper bars and massive copper traces on the boards are used internally instead of wires and connectors, while in this simplified model, only massive copper traces are used. The preamp section uses high quality operational amplifiers from Texas Instruments. If the signal path is so short, and the power supplies are relatively compact, then what is taking up the space in the chassis? There are four switch mode power supplies, with input and output filtering and full regulation. This provides 1200 VA of power, and another two for the control circuitry and the preamp sections. And there is space for two optional modules � a moving coil phono section, and a high-end DAC. There are massive slotted aluminum heat sinks along the two sides. Although the component count in the signal path is low, the circuitry needed to regulate the power supplies and provide protection against thermal overrun and other adverse conditions without impacting the sound of the amplifier � well that takes a lot of real estate. In order to bring costs down without significantly affecting the sound quality, the Series 3 uses smaller power supplies, offers lower maximum current output, which really only affects output into the lowest impedance loads. My YG Carmel 2's have a nominal impedance of 6 Ohms but reach down to 3.5 Ohms at their lowest point. The 330 will not have a problem with this. But some speakers reach down to 2 Ohms or lower, at which point the power supplies might run out of current at the highest sustained levels. If that's the case, you should be looking at the Series 5 or 7 which will take such loads in their stride. This reflects the maximum current output rating of 30 A in the Series 3, 45 A in the 530 and 511, and 120 A in the 711 Stereo Power Amp. If you look at the specifications, you'll see power rated as 120 Watts per channel (Wpc) into 8 Ohms, 240 Wpc into 4 Ohms and 480 into 2 Ohms (dynamic). That indicates instantaneous peak loads into 2 Ohm loads are no problem, but sustained loads of 480 Wpc into 2 Ohms are not supported on the Series 3. 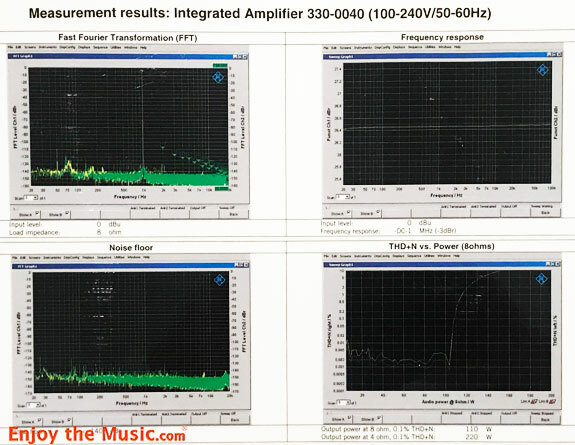 So while there are some qualitative improvements as you move up the range, and there are small increases in the power as measured in watts per channel (311 Stereo � 120 Wpc, 511 Stereo and 711 Stereo � 150 Wpc), by far the biggest differentiator is in the maximum current available, and hence the ease with which an amp can drive the least efficient speakers with the most difficult loads. While we are focused here on the 330 Integrated Stereo Amp, there are two companion pieces, the 325 Preamp and the 311 Stereo Amp. The 330 basically includes the 325 and 311 in one box. The 311 has a ground lift option for each channel, which can help eliminate hums due to Earthing issues but due to the expense, this option is not available on the 330. There are some changes to the power supply to provide power for the preamp section, and we do not have a conventional pre-out or high-level input. But there is an unconventional pre-out! This comprises a pair of balanced outputs which have not passed through the preamp section, so they are unaffected by the volume control. They can be used for mono or stereo multi-amp'ing with a second 330 amplifier. There is also a home theatre bypass and I had hoped I could use this to isolate the power amp section of the 330 so I could try it with my own reference preamp. But what this does in effect is to use the preamp section of the 330 for one selected input, leaving the volume control fixed at any configurable level. There are some operational caveats that I'd like to get out of the way. First, I found it difficult to get the precise level I was looking for. For instance, a small turn from 59 would often move me to 61 rather than 60, something that would never happen on the Pre 2, where the steps are also in increments of 0.5 dB for most of its range, making it much easier to get the exact level you want. Second, the display has room for the volume or the source but not both. So you see the volume as you adjust it (say VOL 28), but soon after it reverts to the input (say IN 2). I would also have liked to have a headphone output for listening in the small hours and a balance control. As mentioned above, I would have liked to be have a true pre-out and a high level input, but I recognize that adding these would not only have increased the cost but also may have compromised the short signal path and hence the sound quality. I also found an operational glitch whereby I could provoke the amplifier to turn itself off while I was adjusting the setup control for initial and maximum volume by pressing the right arrow button on the remote. I reported this issue to Soulution and within a few days a new firmware version was released which fixed this minor anomaly. Installation was very easy using a USB key. One nice touch that I'd like to see repeated elsewhere. As you power up the unit from standby, the front panel tells you where it is in the power on sequence. And when you power down, you see the capacitor readings roll down from 100 to zero. Each amp is measured before it leaves the factory. A laminated page of its test charts is included in the package and is reproduced here. An integrated amp makes for a simplified setup. Just the EMM Labs XDS1 V3 SACD Player, the Soulution 330 and YG Carmel 2 speakers, strung together and fed by Nordost Valhalla 2 cables from a dedicated line and a Nordost QB8 power distribution box. My new listening room is 14' by 17' with the speakers along the long wall. I allowed the amp to run in for over 400 hours using a special Isotek break-in CD and a variety of music CDs on endless repeat. At $20,100 this stereo integrated amplifier is a little less expensive than my EMM Labs Pre 2 ($15,000) and ModWright KWA150 SE ($9000) combo, and of course you save a set of interconnects and a power cord. Because of the inability to isolate the preamp and power amp sections of the 330 I can only tell you what it sounds like as an integrated amp. I can't attribute its qualities between the pre and power sections. If I get my hands on one of the Soulution Series 3 separates I can revisit this question. The 330 produces a rock solid stable image that benefits all music you play through it. It has absolute control of the speakers top to bottom (a damping factor of over 5000 should help there), and I should remind you the Carmel 2 is both fairly inefficient (87 dB) and low in nominal impedance (4 Ohms), going close to 3 Ohms at some frequencies, and presents a current hungry load. It is also amazingly transparent, so it provides a great lens through which to view the supporting electronics. The second attribute of the 330's sound is the sheer presence of the performers. They are flesh and blood, massively dynamic and tonally rich, unless your recording is second rate, in which case it will unmercifully reveal all its shortcomings. In that respect the 330 is more critical than my separates which are rather more laid back. The third most salient feature is the extraordinary solidity of the bass, which puts even my separates in the shade. Do you know about the pianist Christian Blackshaw? If you love your Mozart, he's your man. I've heard no end of pianists in the Mozart Sonatas. Some wonderfully recorded (like Robert Silverman on a Ray Kimber SACD box) and some supremely gifted Mozartians (like Walter Klien). But here the extraordinary sound quality of the recording matches the perfection and �lan of the playing. His set of the Mozart Sonatas, recorded live at the Wigmore Hall in London between 2013 and 2015, appears in four double CD albums [WHLive 0061/2, 0069/2, 0076/2 and 0078/2]. Blackshaw has become an overnight sensation, and in his sixties! I've played this music to three of my pianist friends and they all agree that this is extraordinary music making. The piano sound is completely open at the top end with full power and color throughout. I've never been happier with piano sound, the toughest test for any system. If you want to select a single album, I'd recommend Volume 3 where Blackshaw plays the Fantasy in C Minor, perhaps Mozart's most advanced and ahead-of-its-time composition in any form. I did mention the 330's revealing nature. I experienced this especially in two recordings of the Beethoven's Diabelli Variations. Paul Lewis's version [HMC 902071] lost me in the very first bar. The sound lacks proper midrange weight and I found it simply unrealistic and faintly unpleasant. So I pulled out a different recording, a 1985 performance by the veteran Claudio Arrau made in La Chaux-de Fonds, Switzerland, one of 14 CDs in his box of the Complete Beethoven Piano Sonatas and Concertos [Philips 462 358-2]. The contrast could not be greater. The sound here is truly wonderful. The famous Arrau sonority, which I've been fortunate to experience in the flesh a number of times, captured faithfully and admirably revealed through these elite components. The piano has the full weight and clarity it should have, the dynamics are preserved intact. The reward for building such a revealing and accurate system is the opportunity to hear a transcendental artist at the height of his powers, performing one of the peaks of the literature. I am sold. Different recordings may challenge a system in different ways, but I was unable to catch the 330 out no matter how hard I tried. Full orchestra should put any amplifier through its paces. Haitink's Shostakovich Fifth Symphony [DECCA 425066-2] reveals a wealth of color, a full bandwidth, sensational imaging and a true sense of sadness and menace by turns. I particularly relish the realism and solidity brought to the string sound and the delicious woodwind, while the horns are strikingly rich and direct. You can understand the inspiration that Shostakovich received from Mahler in his consummate use of the orchestra. Stepping back through time, Ren� Jacob's performance of Haydn's Creation [HMC 992039.40] is surely one of the peaks of recorded music. I never knew how beautiful Maximilian Schmitt's voice was until the Soulution came into my system. This recording poses the most serious challenges in terms of dynamics. The 330 passes with flying colors. No coarsening of tone at the highest levels, no covering of any instrument's voice by another's louder voice. Exemplary! Before leaving classical music, I turned to my favorite genre, chamber music, which has very different demands from either solo piano or large-scale works. Here tonal accuracy, transient performance and the ability to conjure up a realistic 3-dimensional space are of supreme importance. I found no struggle with the sometimes strident tonality of original instruments on the Quatuor Mosa�ques disk of Haydn's Opus 20 [Astree E 8786]. Instead there is warmth, power and instantaneous reflexes, including sustained harmonics with no trace of overhang or ringing. And let me recommend to you the superb sound of the Gaudier Ensemble in Spohr's Nonet [Hyperion CDA6699],never better than through the Soulution which has the full measure of its rich beauty and a wonderful blend of bassoon, horn, oboe and flute with a string quintet. Now Jazz. I'll start with Holly Cole because I have a fresh recollection of her sound from the 2018 Toronto Jazz Festival. "My Baby Just Cries For Me" from Girl Talk [Albert Music Z2-81016] finds Cole partnered by David Piltch's string bass. What a bass player! Here there is terrific spring in the bass solo. Again it starts and stops on a dime. Its pitch accuracy is perfect, but there is also full attack and presence. I'm sure the sealed box nature of the YG Carmel 2 helps here but it sounds way better and fuller than through the reference amplification components (EMM Pre 2 and KWA150SE). Add in Cole's beautiful husky voice which goes the gamut from a whisper to full throat and you've got a track that always sounds great but can be dynamic and moving depending on the system. This one takes the cake. Alfie is one of Sonny Rollins finest and best recorded albums. It was recorded in 1966 at the Van Gelder Studio with Rudy Van Gilder as engineer, Bob Thiele as producer, music written for the film of the same name by Sonny Rollins, arranged and conducted by Oliver Nelson and featured top artists including Phil Woods, Kenny Burrell and JJ Johnson. Sadly, Roger Kellaway's piano sound is not as well captured as the other musicians, but in truth, this is all about Sonny Rollins and it's sensational. Through the 330 there's a wealth of fine detail unmasked, and I particularly enjoyed Kenny Burrell's guitar contributions on the title track. The bass of Walter Booker is unusually clear and elegant. Rollins himself is masterful and chock-full of color and rhythmic invention. His playing is like a man having an argument, with rich and varied vocal inflection. Each instrument is precisely located in space, so it is easy to make sense of it all. OK, you want Kind of Blue. I have two versions, the Columbia SACD [CS 64935] and the Columbia CD [CK 64935]. Surprisingly the CD sound way better balanced than the SACD (where Miles is way back in the mix) so that's what I will write about. "So What" sounds better than I have ever heard it through the 330. Coltrane in particular is stunning. He has a wonderful rich powerful and forward sound that draws you right in. The percussion is not as far forward as the SACD but you can still hear all the detail. Miles has never sounded clearer or more exquisite in tone. The imaging is fabulous and it's obvious why music lovers and audiophiles both rave over this seminal album. Another beautifully recorded jazz album is Dian Krall's tribute to Nat King Cole, All for You [Justin Time JTR8458-2]. "The Boulevard of Broken Dreams" seems slower and more luxurious than ever. The piano sounds great, the image deep and wide, the presence is high and there is bass warmth which loads the room without bloat. This is irresistible. "If I Had You" where Benny Green stands in for Krall on the piano, the reproduction is perfect. Such color in the voice and in the piano, the limitless and effortless dynamics. The top end too is startlingly clear and open. I listened to classical and acoustic jazz music first, because it is the most demanding of all the qualities any audio component should provide. OK, it may not always stretch the deep bass as much as some pop music or electrified jazz, but at least we know for sure what acoustical music can and should sound like � there is no such standard for music we usually hear through stage amplification. But let's go there anyway and see if there are any surprises in store. I am a huge Bob Dylan fan, but I've often felt let down by the sound on the recordings. Sometimes thin, sometimes bass heavy, often high compressed. But I got significant satisfaction with the sound on Modern Times [Columbia 82876 87606 2] which the Soulution Amp serves better than my separates. "Nettie Moore" is some of the best Dylan sound I've heard (not a high bar). Every word is clear, the voice present and firm. Even though the voice follows the accompaniment closely, it is easy to follow each independently. "The Levee's Gonna Break" is a return to the more mumbly voice he often favors, but rocks heavily and is not the least phasey. My favorite on this album and one of the best Dylan songs of all time, "Ain't takin'" has great forward momentum with excellent support from the percussion, plus a realistic and gentle guitar sound. And again, you can make out every word, and there are a lot of them. I also ran through my Beatles collection, especially the remixed Sgt. Pepper and Love. The 330 brings great clarity, beauty and drive to this material. No weak points exposed. The 330 has some limitations in flexibility as I mentioned before. But the ability to add a phono section and a DAC section in this chassis gives you the further option to greatly simplify a high-end system. I didn't get to test these add-ons, but if they perform to the same high standards as the pre and power amp sections, we are in for a treat. So I am at a loss to criticize the Soulution, even at its elevated price. Yes, I have heard more delicacy and top end definition through my separates on some recordings, and the 330 is merciless when the recording itself is at fault. On the other hand, when the recording is of the highest caliber, the 330 is sensationally good over virtually every dimension of sound that I can think of, and I give it my fullest recommendation for an integrated amplifier. I have never been sadder to have to pack up a review component. 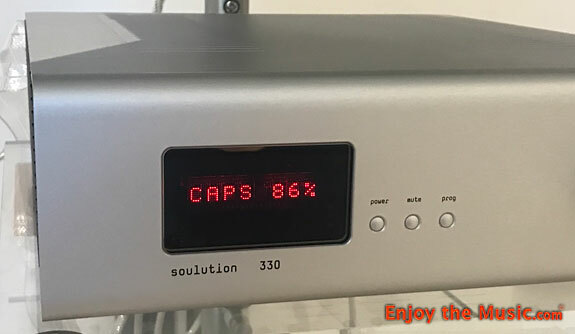 For more information about Soulution Audio, and its parent Spemot, please read our 2013 review of the big brother Soulution 530 Integrated Amplifier here. 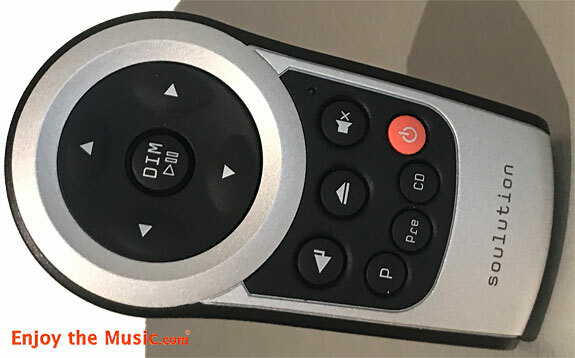 This is where Enjoy the Music.com's Wojciech Pacula concludes: "In general, it is unlike anything I have ever heard; in details it shows surprising similarity to various types of equipment, sometimes to specific brands and models. General tonal balance closely reminds me of what I heard from the D-Premier AIR digital amplifier on the one hand, and the Tenor Audio 175T hybrid amp on the other. It is silk, dark background, slightly softened sound attack. The 530 is, however, better from both these devices in its deeper background, better speaker control and something elusive that makes us wait in anticipation for the next track even if we know the album very well. The dynamics is similar to the Accuphase A-200 and the Soulution 710." "The above two are the best solid-state amplifiers I know, "Wojciech continues. "They have a little deeper bass extension; they are a bit more defined and selective and better differentiate color and instruments bodies. Please take note, however, that we are talking about power amplifiers that are more expensive than the reviewed amplifier which is, after all, an integrated design! In other words, we compare a two times more expensive pre/power system against an integrated amplifier. 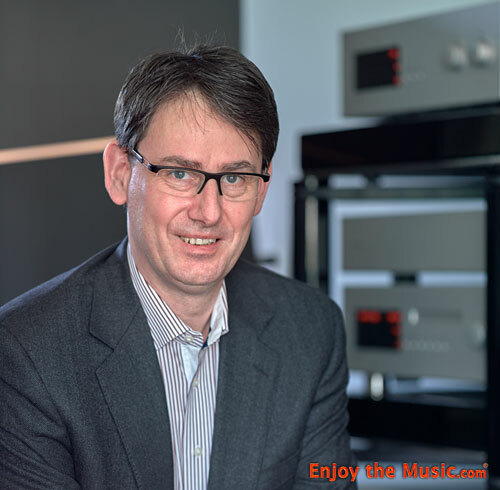 I do not know any other integrated amplifier at this level that could present its point of view so consistently, present � with great success(!) � its own interpretation of what it receives from the source." In terms of technology the 330 differs in many aspects from other designs on the market, be it ultra-wide-bandwidth circuits which employ a lot of negative feedback, switched mode power supplies, integrated circuits, etc., etc. In the past we at Soulution have been criticized for employing these so called "non-audiophile" technologies. However, we do not see the technology as an end to itself. It is just a tool for achieving the one and only goal real high-end audio components have to comply with - to reproduce music as close as possible to the nature of its original recording. We are truly thankful that Phil assessed the 330 on its sonic performance.